WRI’s GHG Protocol Team is teaching “the new carbon math” – carbon accounting for GHG measurement and management – by developing e-learning curriculum based on GHG Protocol standards and tools. Under the ‘GHG Management Institute (www.ghginstitute.org),’ WRI will develop a series of online courses in partnership with Earth Council Geneva (ECG), the GHG Experts Network (GEN), and ClimateCheck. The institute aims to provide professional training on how to measure and manage GHG emissions. “The Institute’s philosophy is ‘if you cannot accurately measure GHG emissions, you cannot manage them’,” Michael Gillenwater, the Dean of the Institute and the Director of the GHG Experts Network, said in a press release. Starting Nov. 1, students can enroll in the “Basics of Organizational GHG Accounting” course, which provides instruction on key GHG Protocol accounting concepts such as accounting principles, design and development of GHG inventories, establishing GHG boundaries, identifying emission sources, GHG targets, quantification procedures, among others. The courses walk users step-by-step through these key concepts, using examples, case studies, and quizzes to build students’ working knowledge of the fundamentals of GHG measurement and management. “The content that our GHG Protocol team designs is considered a global standard. It is critical that energy managers – whether they’re working on projects throughout the developing world or trying to make improvements at their individual companies – really get their heads around these issues.” said Jonathan Lash, WRI President, in a press release. The online courses will provide those who enroll the benefits of learning GHG measurement and management from the experience and best practice from the organizations that originally developed and founded the international standards that form the basis of nearly every national GHG program. The Institute offers students interaction with experts on GHG accounting and reporting from around the world, including WRI’s GHG Protocol Team. “There is far more demand for GHG Protocol training than we have been able to meet by ourselves. We hope the e-learning model will scale up access to GHG Protocol knowledge,” said Senior Associate Taryn Fransen, who was part of the WRI team that helped develop the Institute’s curriculum. Although the GHG Protocol has provided training to partners and businesses in developing countries such as Mexico, the Philippines, South Africa, China, India, and Brazil, the demand for training in both industrialized and other industrializing countries has far exceeded the resources and capacity of the WRI and WBCSD staffs. The GHG Management Institute, therefore, provides global access to everyone, regardless of location. Limited need-based scholarships will also be available to those who require financial assistance. 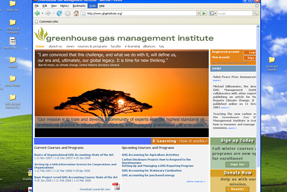 To enroll in the program or to find more information about the Institute, visit www.ghginstitute.org.